The V3 Traverse is a custom-built compact gaming rig that’s housed in the same eggshell-white chassis as the AVADirect Mini Gaming PC. In fact, the V3 Traverse and the Mini Gaming PC are rather similar, spec-wise, though the V3 Traverse sports a less powerful processor, higher end graphics card and some different port options due to using a different motherboard. Our review model, which costs $2509 as configured, features a third-generation Ivy Bridge Intel Core i5-3570K processor, 8GB of RAM, and an Nvidia GeForce GTX 690 graphics card, which uses two GTX 680 GPUs in a single card. The Traverse has two hard drives: a 1TB Hitachi HDD for basic storage, and a 128GB Corsair Force SSD for quick boot-up. The Traverse has built-in Wi-Fi 802.11n and runs a 64-bit version of Windows 7 Home Premium. 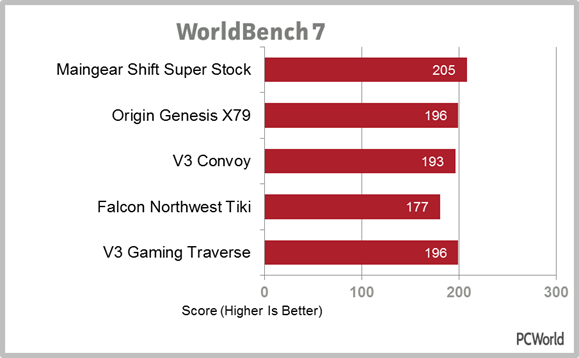 The V3 Traverse manages an excellent overall performance score of 193 (out of 100) on PCWorld’s WorldBench 7 benchmark tests. This means that the Traverse is almost twice as fast (93 percent faster) than our testing model, which shouldn’t be too much of a surprise – our testing model sports a second-generation Intel Core i5-2500K processor, 8GB of RAM, and a 1TB traditional platter hard drive. Our testing model has no SSD, which means certain processes (namely startup and storage) are slower than systems that do sport SSDs, even if they’re small SSDs. Compared to the last three performance desktop PCs we tested, which include the Falcon Northwest Tiki and the V3 Convoy, the V3 Traverse comes out ahead. The average WB7 score of the last three systems tested was 189, which is just slightly lower than the Traverse’s score. The Traverse’s performance on individual tests varies. Though this system has a higher WB7 score than any of the last three desktops we’ve tested, it doesn’t always trump other systems in individual tests. 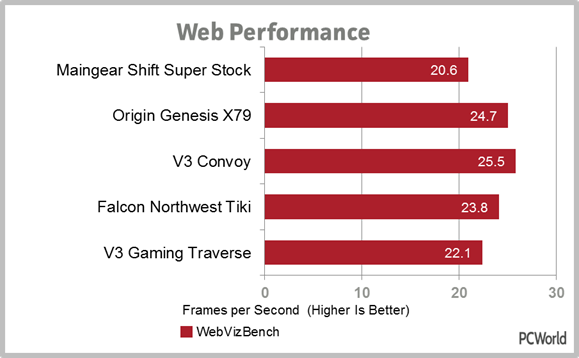 For example, the Traverse performs well in our web performance test, with a frame rate of 22.1 frames per second, but it lags behind the other three systems, which have an average frame rate of 24.7 fps. 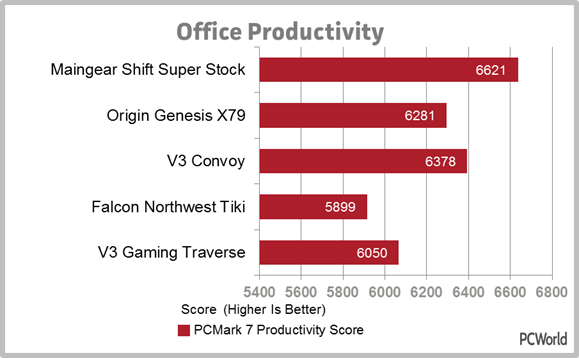 The Traverse isn’t great at office productivity, either – in the PCMark 7 office productivity test, the Traverse scored 6050, which is less (but not much) than the average score of 6186 of the last three performance desktops tested. One area in which the Traverse does shine is start-up time. The system starts up in just 20 seconds, which is probably the fastest start-up time of any performance desktop that I’ve seen. 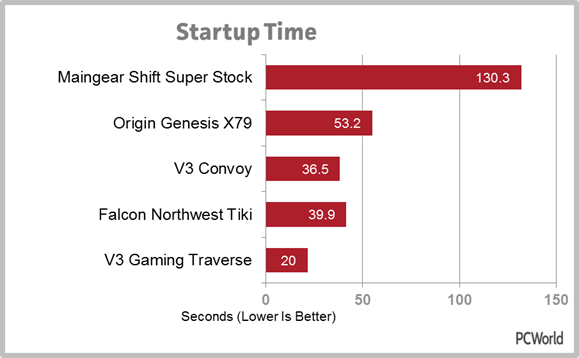 By comparison, the V3 Convoy takes 36.5 seconds to start up, while the Maingear Shift Super Stock – currently our top-rated performance desktop PC – takes over two full minutes. Start-up time isn’t critical on a desktop PC, but being ready to go in 20 seconds is always nice. Graphics performance on the Traverse is up to par with other gaming systems. 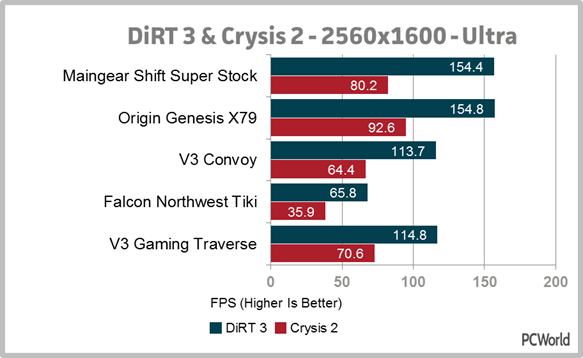 In our Crysis 2 graphics tests, the Traverse managed frame rates of between 70.6 (maximum quality settings, 2560 by 1600 pixel resolution) and 98.1 (low quality settings, 1024 by 768 pixel resolution) frames per second. 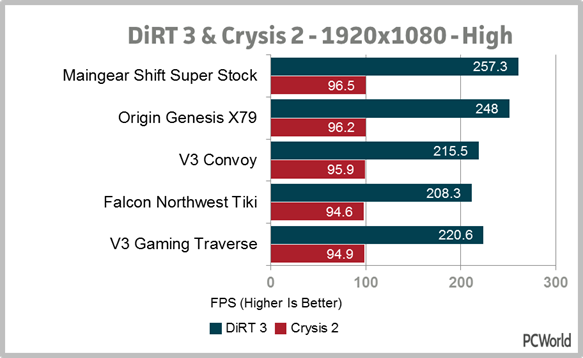 By comparison the average frame rates of the last three desktops tested were between 35.9 and 97.3 fps. At maximum quality graphics settings, the Traverse performs pretty well; the dual GPU GTX 690 is probably a big factor in our gaming results. A lot of systems take a hit at the highest settings and/or highest resolutions, but the Traverse still manages to pop out 70 fps. It’s not quite as consistent as the Origin Genesis X79, though, which manages 92.6 fps at the highest setting/highest resolution, down just a little from its frame rate of 97.3 at the lowest setting/lowest resolution. Then again, the Genesis casts almost twice as much, and is massive. Like the AVADirect Mini Gaming PC, the V3 Traverse is housed in an arctic white BitFenix Prodigy Mini-ITX tower. This tower is fairly small, at just 15 inches tall, and is suspended by springy, rubbery handles made of BitFenix’s special “FyberFlex Composite.” There are two handles on the top of the machine, and two handles on the bottom. The handles are flimsy at best – the top handles don’t seem like they’ll support the weight of the (fully loaded) machine for very long, while the bottom handles have a rounded construction that causes the tower to wobble whenever you touch it. I suppose the handles are good for shock absorption, if you plan on moving your system often, but that’s about it. The V3 Traverse’s chassis is good-looking, if you like the way an egg looks. The rounded handles and the white shell make it look like a very large egg. The mini-tower features flat white sides (the right side has some convenience ports and power/reset buttons, while the left side has a rectangular pattern of dots for ventilation), a white top with a removable black mesh panel, and a white front panel with a black border. The front houses the Traverse’s BD-RW drive, though the drive door is clad in plastic, not brushed aluminum like it is on AVADirect’s system. Getting inside the Traverse’s chassis is easy: both sides come off (and are attached with two thumbscrews at the back), and a large black mesh panel on the top also comes off. The left side opens up to the graphics card, but there are two easily-accessible 5.25-inch drive bays, only one of which is full. The right side is a little trickier, since the there are two USB 3.0 ports on the right panel. However, inside the right panel are three little SSD-sized drive bays attached to the wall, only one of which is full. The Traverse is built with a Zotac Z77 motheboard, and has a decent port selection. The convenience ports, which are located on the right side of the machine, are the same: two USB 3.0 ports, a microphone jack, and a headphone jack. On the back are two more USB 3.0 ports (four total), four USB 2.0 ports, one PS/2 combination port for mouse and keyboard, two Gigabit Ethernet ports, two HDMI outputs, one mini DisplayPort, one SPDIF out, and support for 7.1 surround sound. The AVADirect Mini Gaming PC doesn’t support 7.1 surround sound, but it (sort of) makes up for this with two extra USB 3.0 ports (six total). On the Traverse’s graphics card, you’ll find three DVI outputs and one mini DisplayPort. At just over $2500, the V3 Traverse is sort of budget-friendly – if you’re a gamer looking for a powerful machine, that is. This little egg-inspired gaming PC (don’t worry – if you don’t like the egg look you can always customize your chassis in black) is an excellent overall performer. It’s also got a nice port selection, including a PS/2 combo port for people who still use non-USB mouse or keyboard, support for 7.1 surround sound, and dual Gigabit Ethernet jacks. The Traverse’s mini-tower chassis is easy to open and has a decent amount of space – for a mini-tower. It’s certainly not a computer for a serious upgrader, but if you’re just looking to add an extra SSD or two, it’s definitely worth a look as an upgradeable machine.